Canaima National Park in south-east Venezuela is unique because of its table mountain (tepui) formations. It also includes Angel Falls, the world highest waterfall with a free fall of 1002m. The tepuis are a unique biotic environment and have an important story to tell about earth’s evolutionary history. They provide a spectacular landscape of steep cliffs and waterfalls, largely undisturbed. The national park covers 3.000.000 ha., where about 10.000 Pémon Indian residents live. Canaima has many geological affinities with western Africa and with Monument Valley in Arizona. There is a lot of debate about the best way to visit Angel Falls, either by air or by land (really river). I have just returned from Venezuela and had the benefit of doing both and they are both wonderful but different experiences. I will summarize both and list the pros and cons of each and you can decide. First by air. Most people fly to Cainama form Peurto Ortez in commuter planes that fly regularly once a day. Cainama is a asphalt strip by a big lagoon where most good lodges are situated. The flights to Angel Falls are usually from Cainama and the pilots sit around playing dominoes in thatched huts until they think its time (usually 11am and 2pm when the weather is best) and then they look around for their passengers and take off in old beat up Cessnas. The flight is not too bumpy and the fly bys are spectacular. The pros are 1. The scenery from the air is amazing. You get to see the top of the tepuis, the whole grandeur of the waterfall etc. 2. The trip is pleasant and there is no long journey involved. The cons are 1. The view from the air is less dramatic because you are far from the waterfall and it looks small. 2. The windows of the Cessnas are glazed from age and your view is reduced by up to 50% and 3. The trip is all too short. By river can be done in a one day trip. My wife refused to overnight in a hammock camp and I found that there is a one day excursion everyday from Cainama through Waku Lodge but you do not have to stay at the lodge. You get up at 4am and leave by 5am in a motor canoe up the Carrao River. You stop at 8am for breakfast and then continue up the Churun River. By 10am you are at Rotan Island where you can see the falls. Then you hike for 1.5 hours uphill to the base of the falls. After you come down, there is lunch and you get back to Cainama by 6pm. The pros are 1. When you are at the bottom of the falls, it hits you how spectacular they are. 2. You can spend an hour looking at the falls and the clouds roll in and out and even swim in a pool at the base. The cons are 1. Its a bloody long day. 2. The rainy season means rain there and back. 3. The trek up to the falls was tough for me but not for the young people in our group. 4. I got over 90 insect bites despite the gallon of DEET I put on my legs. After I came home, I decided the river trip was better because of the time I could spend enjoying the experience. You can decide. I visited Canaima National Park in August 2009. The landscape is stunning--the mysterious cloud covered tepuis, the many waterfalls, including Angel Falls that fall from the heights and the canyons and rivers. My perspective was from the ground and water--a three hour or so canoe trip to the Angel Falls with some rapids, though nothing too dangerous, from Canaima airport, a night camping and sleeping in hammocks at the base of the falls, with about 60 other people. The various tours that converge on this site can get crowded but the operators space the hiking trips so groups do not feel too crowded while on the paths but some may chafe at the assembly line nature of the usual 3 day, two night tour package. It's not ideal but really the only way to get to the falls and see a little of the park.The hour or so hike to the base of Angel Falls is not too strenous but there are some steep stretches that some might find tiring. As this was the rainy season (characterized by heavy downfalls in the afternoon and often at night) there were some slippery spots. The drop from the top of the tepui is mesmerizing. The stream of water unfolds like a curtain and then vanishes into mist. It's possible to swim at the base of the falls, but due to the angle it's not possible to look up and see the entire drop. In addition to visits to the falls there are many tour operators in Ciudad Bolivar who offer other options for visits to the park and surrounding areasthat may not be so crowded with a variety of accomodations and prices starting at about $250. It's cheapest to book tours from that city. I booked my tour at the bus station (most of the operators are located at the airport) at 6 AM, right after the operator opened for business and was on my way at 7:30 AM the same day. There is an entry fee to the park, currently about $7.00 at the "unofficial" (i.e. black market) rate. Most tours include trips to Sapo Falls including a great walk behind the falls where buckets of water will blow up against you--a lot of fun. The regularly scheduled flights from Ciudad Bolivar to Canaima may fly by the falls also and allow a glimpse if the day is clear. The clouds can roll in and cover the falls one minute then disappear the next. By the way, Jimmy Angel's plane is back at the airport in Ciudad Bolivar. 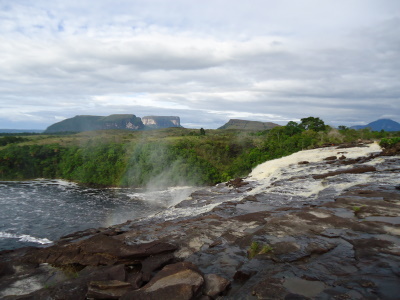 Canaima Park contains one of the World’s “great” waterfalls and some world-class eroded landscape – the isolated mesas locally called “Tepuis”. Given the number of magnificent waterfalls around the World it is perhaps surprising that the WHS list only inscribes 2 by name (Iguassu and Victoria). However a number of other significant examples are situated within the boundaries of larger nominations – including the 2 falls generally considered to be the “tallest” in the World. Those who care will probably know where the second tallest are (and those who don’t know probably don’t care – so I won’t bother to name them, but treat it as a trivia question if you wish!) - but the “tallest”, both in terms of overall and single drop, are Angel Falls situated within the boundaries of Canaima National Park. (Worldwide “waterfall comparison” is rather difficult! How to allow for differences of width, volume of water (average per annum or maximum? ), height overall and “single drop”, slope and “scenic grandeur”? And then there are all the different “types” of falls - those interested in such matters apparently identify 10 different “forms”! Have a look at http://www.world-waterfalls.com/ ). We “visited” Angel Falls in 1990 and remember it as a great trip. I put “visited” in quotes because WHS collectors will have each have their own criteria for what constitutes a satisfactory “visit” and some might consider ours not fully “kosher” since we only saw the Falls, which drop 3212 ft/979 metres from Auyan-Tepui, from the air. It is possible to reach them (or rather their foot) by a mixture of boat and trail from Canaima but the flight by small prop plane is probably the method used by the majority of tourists. Those with time would probably benefit from visiting by both land and air but certainly do NOT miss the flight. It is very spectacular and provides a good feeling for the height and grandeur of the falls themselves as well as of the unique “Tepui” scenery in which they are situated. You also get a chance to see the “top of a tepui”! At the time, those crossing the Atlantic on VIASA got a free return ticket from Caracas to any internal destination served by them and we took advantage of that to reduce the cost of the trip by starting our prop plane excursion at Cuidad Bolivar (they also fly from Porlamar on Isla Margarita). VIASA unfortunately is no more so the “least cost” route may be different now. Our trip included several Angel Falls “fly pasts” on the outward flight in the morning followed by a landing at what the tourist literature calls the “isolated dirt strip at the Pemon Indian outpost of Kavac”. This is not really a cultural experience but rather a means of providing a bit of R+R with a lunch, “canyon walk” and swim - anyway this landing took us inside the “Park” and thus satisfied a stricter definition of “visit” (though the falls are not visible from Kavac)! Unfortunately one aspect of the Park’s “uniqueness”, the biotic specialisms up on the Tepuis, seem inaccessible to ordinary tourists whether they visit by air or land and we didn’t see any on this walk. Our walk guide was a Pemon (wearing a "uniform" in the form of a "Tarzan loincloth" as I remember it!!) but we saw nothing really of their life or culture either. So little did the Venezuelan government care about the Pemon Indians that the entire submission process for the Park was carried out without any “consultation” with the Indians (10000 of whom live within the boundaries) – much to the chagrin of UNESCO! Indeed the documentation shows that IUCN (the review body) were not very happy with the boundaries of the inscription either, since these contain significant “human dominated landscape” which did not meet World Heritage “Universal Values”. It suggested that Venezuela alter the site boundaries to concentrate on the world-unique Tepui area. It appears that the inscription took place on the understanding that this would happen – but, 12 years later, it hasn’t. Our visit was at Easter. This is outside the rainy season and the falls had less water than at other times apparently – but still enough to show them in their full height (photo). At least we were able to see them quite clearly – in the rainy season this is quite often not possible (and the company we used, Aerotuy, states that “fly pasts” are subject to weather conditions). In the afternoon we flew back past the falls again with several more “fly-bys” and experienced a glorious lowering sun over the tepui landscape. On our return to Cuidad Bolivar we saw Jimmy Angel’s original plane sitting wingless in a hangar at the airport, having been removed from the top of the Auyan-Tepui where it had landed and got bogged down in 1935 (It was his “discovery” of the falls which led to them being named after him. I wasn’t aware at the time and didn’t see it but, apparently a replica plane was placed on the tepui top). Later, after renovation, the plane was placed on show outside the airport but I understand that it is now in the Aviation Museum at Maracay.